Power Wash Services cleans concrete surfaces with hot water (180 degrees F) and mild detergents removing dirt, mold, and mildew. Rust and oil spots are spot cleaned. If a sealer will be applied, Power Wash Services acid etches the concrete opening pores in the concrete allowing better adhesion of the sealer. Sealing concrete is important for maintaining the look and life of the surface. Non-slip additives greatly increase traction on wet concrete. Covers unsightly oil and rust stains. Penetrates concrete after it has been etched. Color remains if concrete is scratched. 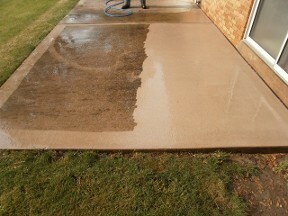 A Clear sealer is recommended over the top of a concrete stain to protect the surface. Sealing makes maintenance simpler. Paint is not recommended for concrete, it does not allow concrete to breath and paint will peel. 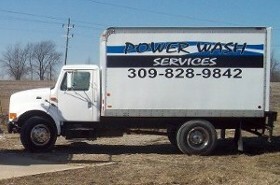 Power wash Services recommends a brown tinted penetrating sealer to make the surface look like it is wet. 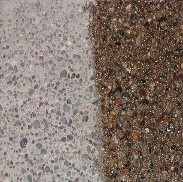 Exposed aggregate surfaces need special care taken because of its brittle top layer. Rocks and iron causing rust marks are removed. 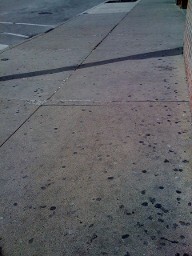 Voids are filled with a special compound which blends into the exposed aggregate. If properly taken care of, exposed aggregate will look beautiful.